We ran into Paul, my client at Warner Bros. Records, on 6th Avenue and he was almost wide-eyed with excitement. "Are you into Beck?" he asked, "I've really been digging Beck." I was confused. "You mean Jeff Beck?" It was 1994 and I couldn't imagine what the ex-Yardbirds, jazz-fusoid axe-slinger could've done at this late date to excite my friend so. "No, just BECK - he has this song Loser, you gotta hear it." Soon enough I was singing "I'm a loser, baby, so why don't you kill me?" along with everyone else. Mellow Gold was a wild ride, and along with the shambolic country-punk-blues of One Foot In The Grave, released that same year, proved the blank-faced kid was no one hit wonder. Even that one-two punch did not quite prepare me for the mastery of Odelay, which took some of the sonic hallmarks of Paul's Boutique (courtesy The Dust Brothers production team) and added heart, soul and tight songwriting. Mutations came next, which developed some of those singer-songwriter strains that had been bubbling around the edges of Beck's work. Although very different than Odelay, it was also basically a perfect record and filled with variety, from the meta-blues of Nobody's Fault But My Own to the Brazil-psych of Tropicalia. I was not a fan of Midnite Vultures from 1999, not because it was cultural imperialism (as some had it), but simply because it was the first reactionary Beck album. Mutations had been a bit of a left turn and didn't go over so well with the huge fan base he had accumulated by then. Midnite Vultures seems like either an attempt to win the old fans back or to piss the new ones off. Them came Sea Change, an even less brash album than Mutations, but one that was widely embraced - it seems his audience had finally caught up with him. One of the great break-up records, Sea Change was also Beck's most sonically gorgeous music, thanks in part to the inventive string arrangements of his father, David Campbell. It's an album that has aged well for me, with more variety of texture and mood than I recall finding at the time. Several of the songs, including Lost Cause and Sunday Sun are among the decade's finest. Three years passed before Guero came out. While it was a solid return to his funky sample-a-delic wheelhouse, and had none of the defensiveness of Midnite Vultures, the sense of having arrived at a plateau was unmistakeable. The Information and Modern Guilt only solidified that impression, with very little in the way of memorable songs. While Beck had worked with name-brand producers before, Modern Guilt was the first time I felt he had subsumed his personality to one, in this case Danger Mouse. Strangely enough, what became his last album for six years has also dated quickly, which should be a caution to other artists seeking the services of Danger Mouse. Already half tuned out, I found myself thinking of Beck as an artist I had connected with only in the past tense. Sure, I kept in touch, following his forays into production along with the online cover bands, the quixotic Song Reader project, etc., but none of it touched me. The Warholian distance that once seemed so intriguing now just seemed distant. I admit this led to some resistance on my part when it came to listening to the early singles from Morning Phase, which may be the most buzzed about album of 2014. That hype was also an obfuscating factor, but I pride myself on listening with open ears no matter what and I felt I owed it to Beck to give Morning Phase a real chance. I knew going in that he had reconvened the musicians with whom he had made Sea Change, including his father, and that it would be mining the singer-songwriter side of his music, something he hadn't done since that album. However, others have been busy in that neck of the woods, including the likes of Bon Iver, Iron & Wine, Fleet Foxes, Jonathan Wilson and Father John Misty - some of my favorite artists of the last six years. Would Beck be able to rally and elbow his way into the august company now occupying some of the space he had staked such a claim to 14 years ago? The answer is an unequivocal "yes." Morning Phase is a triumph from beginning to end, a song cycle characterized by soaring melodies, rich, layered production (by Beck himself), and lyrics that read like an open book but hint at depths of emotion. Themes of renewal (Morning: "It's morning/I've lost all my defenses"), abnegation (Blue Moon: "Cut me down to size/So I can fit inside"), and loneliness (Wave, and elsewhere) strike universal chords but seem to come from a place of wisdom and experience. Echoes of classic music by the Allman Brothers, Pink Floyd, The Beatles, Bob Dylan, Led Zeppelin, David Crosby, and others serve as guideposts for the listener, and likely for Beck himself, without ever sounding slavish. As With Sea Change, Morning Phase reveals more variety with each listen, unfurling colors the way petals unfold in a time lapse of a blossoming flower. At first, I heard what seemed an uninterrupted haze of acoustic guitars, strings and gentle percussion, but soon began to crave the individual songs and their details. The warm ostinato of Heart Like A Drum, the brooding rhythm of Unforgiven, the perfect Kenny Buttrey drums of Country Down, and finally the apotheosis of Waking Light, which builds to an explosive (in this context) Leslie-fied guitar solo and ends the album with a solid crunch that is both startling and satisfying. Morning Phase already feels like an old friend, and the fact that it signals the return of Beck at his best makes it even more meaningful. My message to any other Beck apostates out there is "Are you into Beck? I've really been digging Beck." Amber Papini could probably order coffee with a cadence that would stick in your head for days. Though the singer from Hospitality is from Kansas City, MO, she has an unusual relationship to vowels and her consonants often have a crisp anglophonic sound. The end result is that the hooks in the band's perfectly composed songs have captivating little hooks of their own, but never in a self-consciously quirky way. She's never trying to be different - she just is. While she's a very talented musician, probably the best thing that could have happened to her was hooking up with Nathan Michel, a Berklee grad with a degree in electronic music (he's "obsessed with Stravinsky," apparently), whose training may help lend a compositional rigor to Hospitality's sound. Their charming debut album from 2012 featured a highly detailed (some have called it Baroque) production that seems to not have been entirely of their choosing, as hinted at by the rawer sounds of The Drift and Monkey, two songs released later that year. Also, some of songs dated back to as far as 2007, before family issues sidelined Papini's career for a couple of years, so their concerns might not have been as up to the minute as they sounded, at least in relation to the lives of Papini and Michel and their bass-playing compatriot Brian Betancourt. So now we have the follow-up, called Trouble, produced by Michel with Matt Boynton, and sounding like a sleeker take on the sound of The Drift. Nightingale opens the album with big chords and a tough riff from Papini's guitar that alternates with delicate cello-infused verses. The lyrics, rather than sounding like a plot-line from Girls (nothing wrong with that), delve poetically into that dark terrain where childhood tales mingle with adult realities. This theme is picked up in Going Out, with it's dress-up imagery ("Ruffled dresses and parasols") leading to our heroine walking home alone as the "rain rolls down/like an empty sound." The mood is leavened by some nifty handclaps and percussion as the song plays out. Betancourt's limber, melodic bass proves itself essential here, as it does throughout the album. While Trouble still has some of the enveloping warmth of the first album, there's an intriguing chill at its core, like an icy stare from a friend you inadvertently offended. Even for all that, Hospitality's pop instincts are even more well-honed. Rockets And Jets toys with synth-pop and becomes more of a companion to my life with each listen. Like all great songs, you miss it when it ends. The bleakest moments on the album come in Last Words, also the longest track and one of two Papini co-wrote with Michel. "I took a boat to Eden," she sings in the second verse, "The priest was there to greet me on the sand/He led me to a gate/You enter once but never leave again/These brackish waves/Surround me and I have no exit." Pulling that blanket tighter yet? Last Words leads into the stunning melancholy of Sunship, the other co-write, which has the largest ensemble on the record as the core trio is joined by trumpet, cello and flute. Like five other songs on Trouble, Papini calls on water, either from the sky or in the sea, in her evocative lyrics. These ancient tropes shore up the classicism of Hospitality's approach as, like Spoon, another great band on Merge Records, they seek not to reinvent the canon but to add to it. Also like Spoon, their 10 song album is concise but never feels slight. The last song, Call Me After, features Papini solo and feels entirely complete. If she ever does find herself alone - as her characters do in four of the songs on Trouble - you get the distinct idea she'll be fine. And there's your comfort, cold though it may be. I took my daughter and her friend, both ninth graders, to see Hospitality at The Greene Space. As we waited to enter, a woman (who turned out to be Michel's mother - and Papini's mother-in-law) asked me if the girls were in the string quartet. I had no idea what she was talking about until we sat down and, after some remarks, Helga Davis introduced Pannonia, a string quartet made up of high school students from the Face The Music Program. In the collaborative spirit of the 2014 Ecstatic Music Festival, which was kicked off with this concert, Hospitality would be performing with the young musicians for part of the show. Not surprisingly, it sounded terrific. As Michel remarked when asked about working with the quartet, "I think that Amber's songs can live in a lot of different worlds, and so it was actually a pretty natural translation from the rock band format." Even though he admitted to having little experience in arranging for strings, his adaptations of Rockets And Jets, Nightengale, and Sunship from Trouble, and Argonauts from the first album, flowed beautifully and captured the emotional tenor of each song perfectly. Pannonia also performed his first string quartet, Offshore (there's the ocean again), which was short and to the point and melodically redolent of classic American composers like Copland and Ives. The quartet played beautifully as well - obviously Face The Music is working wonders. Hospitality finished the night with a short set as a band and while they didn't stretch out a lot, they did push some of the dissonant and abrasive leanings of Trouble slightly to the fore, while beefing up the older songs a bit. Besides his arranging skills, Michel is a triple-threat on stage, handling guitar, drums and keyboard with ease. 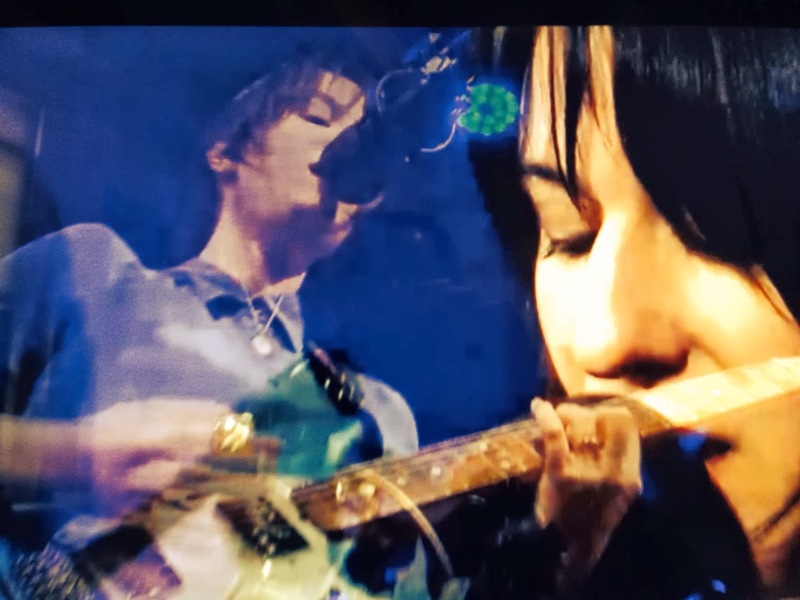 Papini was assured on the keyboard as well and proved herself dynamic and occasionally explosive on guitar, while Betancourt wielded his Hofner bass with aplomb. They were aided by an unnamed drummer who stayed in the pocket and switched to keyboard as necessary. So, the "rock band format" was a success as well for Hospitality - no trouble at all. Watch Hospitality and Pannonia at The Green Space below and keep an eye out for them in your town. Here's an annotated series of tweets as a review of Elizabeth Weisser's concert at Mannes College on Tuesday, February 4th. Weisser is the violist and Director of Development for Talea Ensemble, one of the most remarkable new music ensembles in a city that now boasts more than a few such groups. Tweet 1: "@AnEarful: From world premieres to Schumann - violist Beth Weisser of @TaleaEnsemble w/piano & electronics TONIGHT @MannesCollege. #free #music"
I believe in promoting the artists I like on Twitter, Facebook and in conversation. I did get one thing wrong in my zeal, however: There were no world premieres, but there was a U.S. Premiere of a piece by Austrian composer Bernhard Gander. Tweet 2: "@AnEarful: Beth Weisser of @taleaensemble about to kick it off with Xenakis, then Bach, Diaz de Leon, Gander, Dillon and Schumann. #newmusic"
Six composers, three of them living. Even someone barely familiar with composed music would probably note that something interesting was going on here. It was a program designed with intelligence and a keen musicality. Tweet 3: "@AnEarful: Embellie by Xenakis is an agitated incantation, expertly played by Beth Weisser at Mannes - and Bach's BWV 1005 followed perfectly." Iannis Xenakis was a Greek-born France-based composer (he died in 2001) known for spiky, virtuosic music such as his demanding string quartets. While he made use of electronics at times, Embellie, composed in 1981, is strictly a solo piece for viola. It's full of dark-hued tones and haunting sounds produced by well-deployed extended techniques. Weisser truly is an expert at this sort of thing, having played music that asks almost anything of her, short of smashing her instrument over her knee. Bach's Sonata for Solo Violin No. 3 in C Major has been transcribed for many instruments so playing it on viola is not much of a leap. Composed in 1720, it may be the longest and most difficult of the works Bach wrote in this vein. According to All Music, the great Jascha Heifetz "...used to break out in a cold sweat and suffer nervous bow-shakes when playing it..." but here was Beth Weisser in her chic silver and black outfit playing it, as she did the Xenakis, without sheet music. There was a moment or two where she seemed on the verge of losing the thread but she never did. Her approach, along with the deep sound of the viola, brought out the extraordinary harmonic sophistication in Bach's writing and the lyrical dance-like sections sang out beautifully. "21st century Bach," as my friend accurately observed when the applause had died down. Tweet 4: "@AnEarful: ii. 23 by @m_diazdeleon is a ballet for viola & electronics - in a fractured mirror, executed flawlessly by Beth Weisser @MannesCollege"
I was excited about Mario Diaz de León's entry on the program, having been introduced to his tough-minded music last year. As it happens, Weisser has been performing the cryptically titled ii. 23 since at least 2009 when she played it with "an impressive old-fashioned virtuosity." It still sounds as fresh as a newly crushed daisy as the viola jabs at and soars over a prickly yet rich electronic soundscape. The "fractured mirror" refers to the way Diaz de León's programming sometimes seemed to be an amplified echo of what the viola played. After the Bach, it was a thrilling romp on the cutting edge. You can hear an excellent recording, though not by Weisser, on Diaz de León's Enter Houses Of from 2009. Tweet 5: "@AnEarful: There's a violent play in Bernhard Gander's The Orpheus File II, like tiger cubs grown too old for sparring. 1st US perf by Beth Weisser." Bernhard Gander's piece, more accurately titled Die Orpheus Akte II, is a remarkable piece for viola, piano and shards of aggressive, noisy recorded sound that threaten to overwhelm the acoustic instruments. It did feel a little dangerous, but with a sense of fun, hence my imagery above. Weisser's fluent, commanding playing was matched by Stephen Gosling on piano while David Adamcyk dealt out the electronics without a hitch. While this was indeed the first time Die Orpheus was performed on our shores, it certainly won't be the last: Talea is including it in their Inside Out concert at the Austrian Cultural Forum on March 4th, along with music by Pierluigi Billone and Olga Neuwirth. U.S. premieres of works by all three composers will be featured a few days later at Bohemian National Hall. You're running out of excuses now, aren't you? Tweet 6: "@AnEarful: James Dillon's lyrical yet astringent Siorram should lead perfectly into Schumann's Marchenbilder to close Beth Weisser's concert." James Dillon is a prolific Scottish composer whose work Talea has championed for some time. Weisser has played the knotty Siorram before but after the detonation of the Gander it seemed almost introspective. Siorram is the Gaelic word for "sheriff" although it's hard to guess at any programmatic content for the short piece. Perhaps some of the lyricism is derived from the Scottish traditional Siorram Sios Siorram Suas, but the limb I'm on is about to crack. Tweet 7: "@AnEarful: Indeed, Schumann's sparkling, song-filled Marchenbilder sends us into the night on warm billows of melody. A triumph for Beth Weisser!" It may be unfashionable to say so, but I'll take Schumann over Mendelssohn or Brahms any day. I even like his symphonies and the big pieces like Genoveva, one of the most sheerly beautiful operas of the Romantic era. That said, there is no doubt that his strongest body of work is chamber music and songs. Marchenbilder, or Fairy Tale Pictures, stands with his best work and Weisser and Gosling gave a stylish, assured and colorful performance. You could clearly see the knight defending the lady in the brisk second movement, along with all the other characters Schumann brought to life. Marchenbilder was in a way the most old-fashioned music played at Mannes, even including the Bach, but there is a reason we still tell fairy tales to our children and those "warm billows of melody" were just what the ecstatic audience needed as we headed out to negotiate the ice, slush and snow that awaited us on the streets of New York City. Like a well-made mix tape, Elizabeth Weisser's concert was a captivating look into one of the most fascinating minds on the current musical scene. I felt lucky to be there. On the occasion of Bob Marley's 69th birthday, here's the tale of that time I saw him in concert. One of the most remarkable - and memorable - concerts I've seen was Bob Marley & The Wailers at Madison Square Garden. It was September 19th, 1980, the first of his last two dates in NYC - although we didn't know that then. He was trying to get more recognition from the black American audience and so was appearing with Kurtis Blow and The Commodores. I went with three of my partners in crime, John, Mike and Mike's older brother, Stephen. The cavernous Garden was packed and Kurtis Blow looked very small from our seats. This may have been his first appearance in an arena but he did fine, although the crowd was somewhat indifferent. We dug hearing The Breaks blasting through the huge place. When he was done, we headed right down to the floor and found a spot to stand just about a yard from the barrier to the press and VIP section. We were as close as we could get to the stage. The lights went down and ten musicians and singers took the stage and immediately started playing a loose jam. I was ecstatic from the first note. We worshiped many of these musicians, especially bass player Aston "Family Man" Barrett and his brother, drummer Carlton "Carly" Barrett, and to hear them live was a revelation. As a bass player myself, it was hard to take my eyes off of Family Man's nimble fingers. As the groove reached it's peak, Bob bounded on stage to a deafening roar. The band shifted into Natural Mystic and all of us who were standing in the front began to move in unison to the hypnotic rhythm. 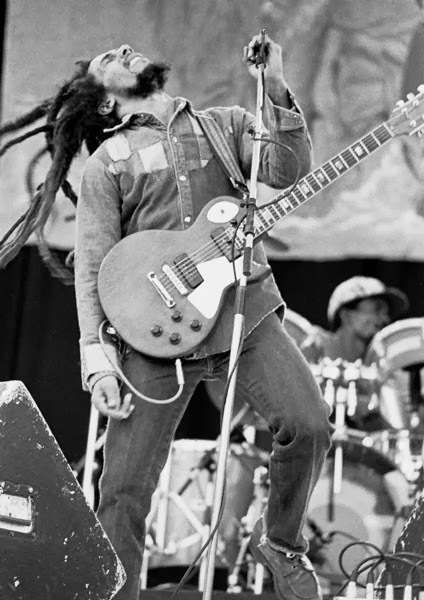 To the right were three young girls who mirrored the moves and sang along with the I-Threes, the backing singers who included Rita Marley, Bob's wife. Their crisp, bright singing was a highlight among many highlights. Early in the set, Bob sang Forever Loving Jah, one of my favorite songs from his last album - I later learned it was the only time he ever sang it live. There was not a flawed moment in the set, but it was too short, ending after about an hour. Because The Commodores were up next, there was no encore. We were walking on air, however, as we headed for one of the exit tunnels while waiting for Lionel Richie, etc. to take the stage. We really only wanted to hear The Commodores do one song. They killed with Brick House,which included a long, funky bass solo. When Once, Twice, Three Times A Lady started up, we turned to leave and found ourselves surrounded. It was a bunch of big dudes and they were asking for money. We were getting mugged right in MSG! Somehow I became the focus of their attentions and three of them were staring at me. I think I must have refused to give them anything because next thing I knew I was getting punched in the head. That triggered us to push through all of them and run down to the next tunnel. There we found a security guard and breathlessly told him that I had been attacked and thugs were roaming the halls of MSG. Then things got really weird. The security guard pulled out a pen knife and began menacing us with it, joking about how we were scared. After struggling to process exactly what was happening, we did the only sane thing: we turned and hightailed it out of there. As we fled into the bustling NYC night, The Commodores continued their smooth songs of love. It was a wild night, but in the end all that mattered was that we had seen one of the most astonishing performers of all time. Bob Marley had stood only yards away from us and sang some of his greatest songs. Even before I realized that I had seen one of his last concerts (he would only perform twice more), I would have gladly taken another punch in the head for another opportunity to see him on stage. 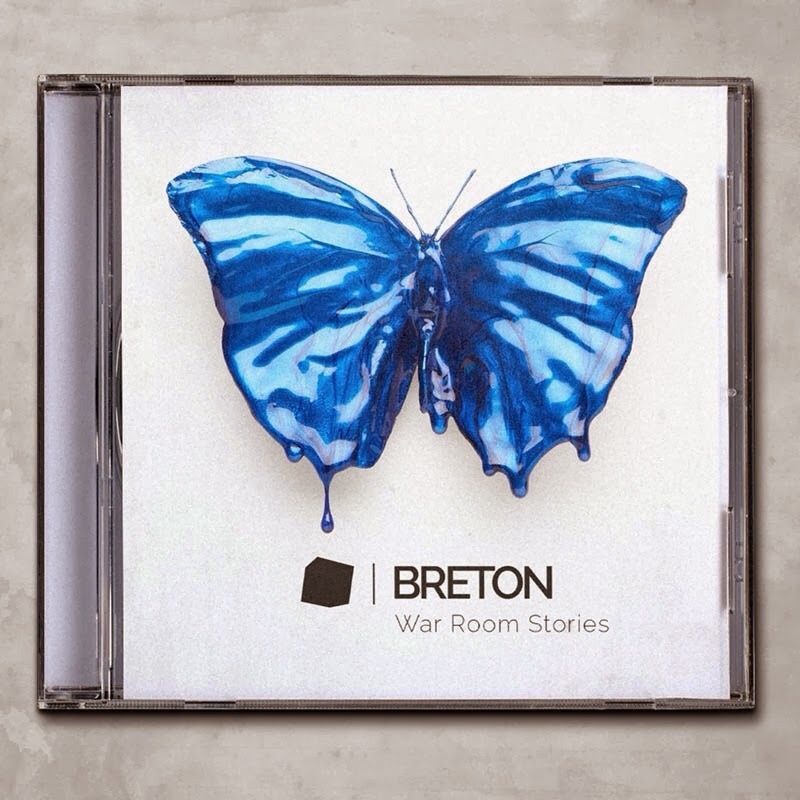 On Breton's second album, War Room Stories, the brief - electronic sounds and organic instruments combined, vocals alternately soulful, anthemic or quietly enraged, found sounds, dance rhythms - is maintained, but the parameters are expanded significantly. Listened back to back with their debut, Other People's Problems from 2012, the leap in sophistication of both songwriting and production is striking. One main difference between that album and this one is that they worked mainly in Berlin, out of their usual London haunts. Also, singer/guitarist Roman Rappak composed and arranged orchestral parts for five songs, which were then recorded by a 44 piece orchestra in Macedonia, an ambitious plan that is executed with perfect assurance. The first song, Envy, is further evidence of their widened scope, as it is very nearly a sunny pop song, a fact that will likely surprise those who think they have Breton pegged. There are even steel drums, coming on like rare sunshine in the alleys of Brixton. "Cos you're a tourist/There's nothing wrong with that," Rappak sings, almost tossing off the words, "What you never could've noticed/Is how your bags were packed." Of course, it's never that easy: "It's how the odds were stacked against you/You're only here as long as they rented it to you." The song also has a tricky prog underpinning that keeps you on your toes while demonstrating a new nimbleness to the rhythm section of Adam Ainger (drums) and Dan McIlvenny (bass). Envy leads into the darker realms of S Four, all ticking rhythm box beats and pizzicato strings until Ainger's drums kick in and the song finds its footing, eventually arriving at an epic sweep courtesy that Macedonian orchestra. Legs & Arms also has plenty of sweep, along with a stomping swagger slightly reminiscent of Edward The Confessor from the debut. Rappak's vocals are processed to a thin stream of static, and the lyrics are slightly threatening: "I've found a way of walking without sound/What scrapes the skin/I'll weigh you up/I'll weigh you in." Somehow in this forbidding atmosphere Breton manage to inject hooks by way of Ian Patterson's keyboard line or in the background vocals, further signs of their expertise in building a track. Got Well Soon was the first track leaked from the album in late 2013, it's doomy synths a perfect accompaniment for the grimly hopeful video created by the band. The little film tells the tale of a suicidal teen rescued by a would-be home invader, a pointed example of how some of the most important connections in life have randomness in their DNA. Speaking of DNA, the song has antecedents in the chattering keyboards of Talking Heads and the witty swing of Dennis Davis's drumming on Bowie's Fashion - good bones indeed. The Macedonians - conducted by a man named Igor, apparently - return in the reflective Closed Category, its refrain of "Stay poor, spend more," undercutting the lush orchestration. National Grid's fleet rhythms and driving bass are surrounded by clouds of synths and the insinuating tone Rappak adopts to sing "Well we haven't got a school and we haven't got a name/And they're struggling to count us now," lends a further edge to the post-apocalyptic atmosphere. The two-tone police siren that ends National Grid provides a direct bridge to Search Party, which seems to take place in the same burned-out civilization. This time, the the air of casual violence is leavened by the strings, and the tolling bells in the fade out brighten the mood as well. Maybe there is "hope for us," to quote the chorus of Breton's terrific 2012 single, Population Density. 302 Watchtowers is sadly lyrical and may well be the most sheerly beautiful song on War Room Stories, with gradually accreting layers of electronics and vocals. Brothers starts off similarly, and just when the album seems to be miring down slightly, it takes another turn toward dance-pop. Between the percussion, the vocal effects and the catchy chorus, remixers are going to have a field day - as they often do with Breton's music. The album ends with 15 Minutes From Now, which alternates static moments with the band at full gallop, strings soaring overhead, in an optimistic show of strength. The ultimate message of the song, and War Room Stories as a whole, maybe boiled down to "if we all stick together we'll be alright," but it's Breton's clear-eyed acknowledgment of the complexities of sticking together that lends teeth to their worldview. Most humans have no doubt that they need a society of others to survive and perpetuate the race, yet that doesn't stop a notable proportion of our planet's inhabitants from stabbing their kin in the back in some fashion or another. Perhaps another version of the message would be "accept dependence but be wary." And the way the album ends with 30 seconds of mechanical noise - film running out of a projector? a ventilation system struggling to function? - somehow conveys the idea that these War Room Stories are far from over. The album comes out digitally on 2/4 and physically on 2/11, and their North American tour begins in Dallas on March 16th, touching down at Glasslands in Brooklyn on May 16th. If all goes as usual, the show will feature visuals edited live by Ryan McClarnon. Breton sell out to 1,000's in Europe - catch them in an intimate venue while you can.